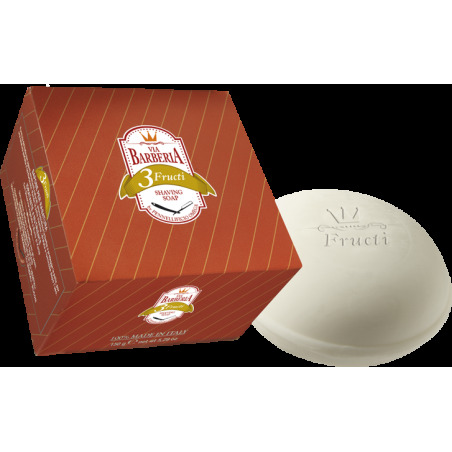 Via Barberia Fructi Shaving Soap 150g. This delicate formula made using natural emollients creates a rich, creamy lather that softens the beard and protects the skin from irritation. It allows for a perfect, comfortable shave. It leaves your skin moisturised and looking radiant after each use. 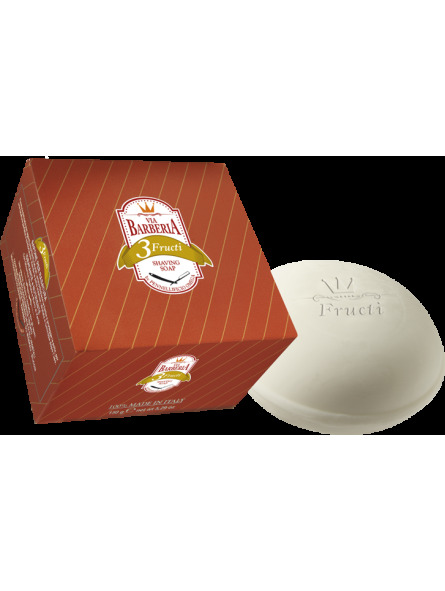 With moisturising vegetable extracts along with smoothing and nourishing Shea Butter. Fructi Aroma: Rich in fruity notes. Lime, mandarine and sweet orange. A perfect combination creating a clean, natural vibrant aroma. Pure energy and nature. Dermatologically tested. High in active ingredients and plant oils. Contains no colourings, preservatives, silicones or mineral oils. Via Barbería is the new brand of shaving products from Omega. Omega is a leader in its field and has been manufacturing shaving brushes for over 80 years. The name for this new line of products has been inspired by the famous Street in Bologna “Via Barbería” where the very best Italian establishments can be found keeping traditional shaving alive and where the authentic shaving ritual lives on to this very day.